A design for ‘Today’, with a bit of yesterday. 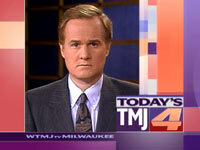 When WTMJ wanted to become ‘Today’s TMJ 4’, could the new look reflect tradition and state-of-the-art television simultaneously? I really have a soft spot in my heart for the traditions of old-line broadcasting...but that doesn't mean I think that classic dominant affiliates should look like stodgy refugees from the 1960s. 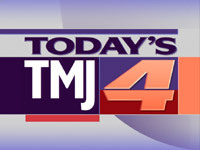 When WTMJ, a long-established NBC affiliate in Milwaukee, owned by the people who owned The Milwaukee Journal (now the Journal-Sentinel), wanted to become 'Today's TMJ 4', I tried to offer an approach that respected the best of tradition in a contemporary environment. In other words, don't throw out what people identify with when..uh..people identify with it. 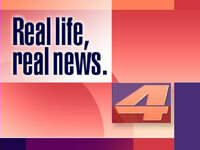 Like the channel '4' logo. I knew that the '4' they used had become part of the community. It was visible all over town, from the baseball stadium to the backs of buses. 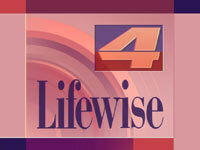 So if you're saying that the channel is the one you know and love—but brought up to date—then it made sense to me to keep the basic shape of the '4'...but give it some energy by slightly italicizing it, and then place it in a logo module that surrounded it with bold typography and color. 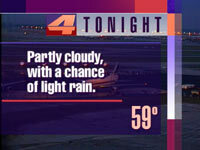 And it's in the realm of color that the TMJ design really shines, if you ask me. I tried to give the channel a rich color palette that supplied a sense of sophistication and energy (simultaneously) without relaying on your basic primary colors that news directors and their consultants love so much. We had a deep brick-red. We had a purply blue. A creamy orange. Large squares of solid color and soft, sweeping arcs of it. This was, for me, one of my favorite excursions into the possibilities of communicating depth and power through color. For that reason alone, the design remains one of my favorites. 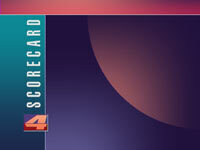 Click here (or on the photos) to see a gallery of WTMJ images.